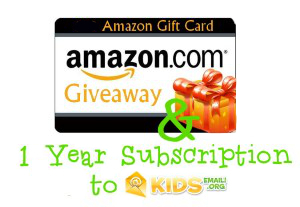 GIVEAWAY: Enter to win a 1-year Kids Email Subscription and $25 Amazon gift card for you and one to give to a friend (Ends 8/23/13 at 11:59 PM EST) | A Savings WOW! Grand Prize: A one-year subscription to Kids Email and a $25 Amazon.com gift card for you and one prize pack to give to a friend! KidsEmail.org is a safe e-mail service for children. KidsEmail.org provides tools for parents to help keep their kids safe while using e-mail. Several options are available to keep them safe. You can choose to get a copy of incoming and outgoing messages that your children sends. KidsEmail.org also has filters to remove images, bad words and spam. They offer a 30 day no obligation trial. The giveaway will open up on 8/20 12:01 am EST and close on 8/23 at 11:59 pm EST. Thank you for entering! Mission Giveaway information: To inquire about becoming a sponsor, please contact Amee or Dawn at missiongiveaway@yahoo.com for details. Take a look at our Media Kit to see what Mission Giveaway has to offer. Are you a blogger that would like to participate in Mission Giveaway? Find out how you can join us.